Why is the company taking on debt to simply pay it out to shareholders in a special dividend? 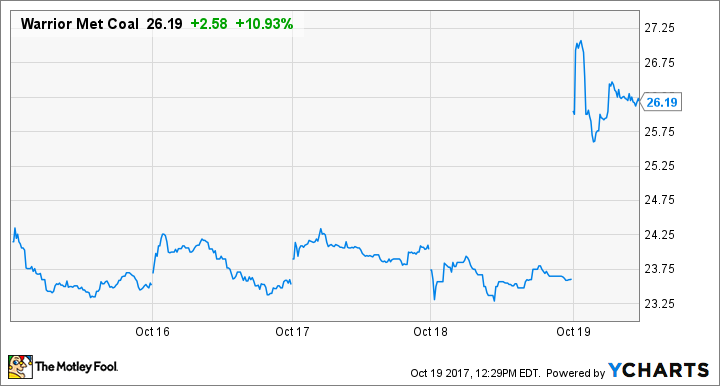 Shares of metallurgical coal miner Warrior Met Coal (NYSE:HCC) are up 11.3% as of 12 p.m. EDT Thursday after the company announced that it was planning on issuing a special dividend...and using debt to pay for part of it. Warrior Met Coal was started by the executive team from the bankrupt Walter Energy, which just coincidentally sold its core metallurgical coal assets to Warrior Met just before Warrior's IPO back in April. According to the company's most recent press release, management intends to float about $350 million in senior notes. The proceeds, coupled with cash on hand of about $260 million, will go toward a special dividend that will be in the $600 million range. Based on today's share count, that amounts to about $11.23 per share -- a yield of 42.9%. This move is a real head-scratcher. Prior to this debt offering, the company had no long-term debt on hand and was generating a decent amount of free cash flow. Certainly, the company has the financials to take on debt, but the question is, why bother? Even if the company were to pay out cash on hand in a special dividend, it would still amount to a sizable yield that would entice most investors to take a look at the company. It also seems a bit strange for a company built on the assets of another company that went bankrupt because of debt problems to lever up for no reason other than to give cash to shareholders. Studying Warrior's financials might have merited a second look at this company. If management is going to make these kinds of reckless moves, though, I don't see a whole lot of reason to get excited about this stock.